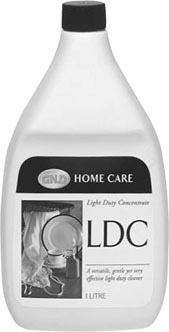 GNLD’s gentle L.D.C. is super concentrated so a little lasts a long time. L.D.C. is a balanced blend of non-ionic surface active agents, reacted coconut oil amides, neutralized organic acids, skin conditioners and hard water ion chelators. All topped off with a fragrance from nature’s own flower shop. Perfect for washing dishes by hand, L.D.C. was “made” for hands, crystal, sterling silver and fine china. Gentle cleaner for fine fabrics. Formulated for animal and vegetable residues. A quick effective demonstration is to put car oil or cooking oil on your hand. Use a little L.D.C. and wash in bowl of clear water. Dry hands with napkin or towel. Comment on fragrance, lotion quality, versatility, rinse-ability and no residue in bowl. L.D.C. is remarkable in that it makes water “wetter”, i.e. it helps water to wet fabrics and soil quickly and thoroughly. To demonstrate this effectively, obtain several pieces of 4-ply wool yarn (3 cms long each is preferable), 250ml of water, a pencil and L.D.C. A phosphate free, clear, viscous, rose-coloured liquid, highly concentrated yet extremely mild. Effective in many cleaning functions. The coconut oil derivatives in L.D.C. make it gentle to the skin. Read labels carefully to ensure best results and greatest safety. Use 1 “healthy” squirt of L.D.C. mixed 1 part L.D.C. to 3 parts water under the force of running water to make lots of bubbles. In hard water you may need a little more. Dishes drain spotless. L.D.C. is mild to your hands. You need no rubber gloves. When washing greasy dishes, L.D.C. will not only remove the grease, but also keeps it in suspension so that it is flushed down the drain. No more messy deposits to wash away from the sides of the sink. Not for use in automatic dishwasher. Appliances, refrigerators, stoves, machinery, etc.